Chosen for Britain At War's March Book of the Month! 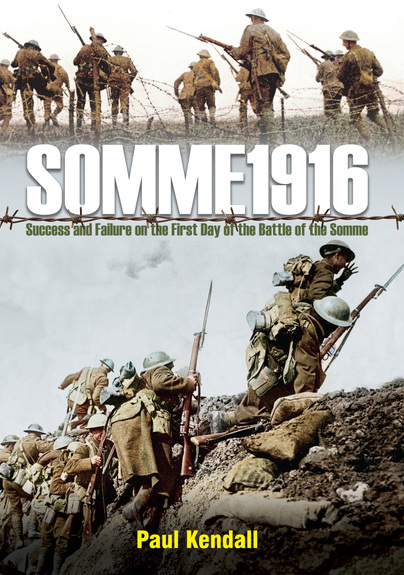 You'll be £12.00 closer to your next £10.00 credit when you purchase Somme 1916. What's this? Much controversy has surrounded the Somme offensive relating to its justification and its impact upon the course of the war. General Sir Douglas Haig's policies have been the subject of considerable debate about whether the heavy losses sustained were worth the small gains that were achieved which appeared to have little strategic value. That was certainly the case on many sectors on 1 July 1916, where British soldiers were unable to cross No Man's Land and failed to reach, or penetrate into, the German trenches. In other sectors, however, breaches were made in the German lines culminating in the capture that day of Leipzig Redoubt, Mametz and Montauban. This book aims to highlight the failures and successes on that day and for the first time evaluate those factors that caused some divisions to succeed in capturing their objectives whilst others failed. An important new study, this book is certain to answer these questions as well as challenging the many myths and misconceptions surrounding the battle that have been propagated for the last 100 years. Admirably researched, this is a detailed account of each brigade attack. This is a useful work. Giving fairly equal coverage to each division along the line means that we get a more accurate picture of the progress of the battle than is sometimes the case - the dramatic disasters naturally attract much of the attention in more general accounts of the battle, with the success on the right almost mentioned in passing. It also becomes clear that there were disasters on the right as well, just not on the same scale. Paul Kendall has done a good job of bringing a diverse array of sources and accounts together to create a cohesive narrative of the day’s events that is equally as useful as a reference work. The Somme and its effect upon the British Army has been written upon and studied at length. Kendall's book is an excellent modern interpretation of this seminal batttle. His writing style is extremely engaging and his analysis clear and concise. He incorporates a myriad of first-hand accounts of individual experiences that add a level of intimacy to the narrative. His conclusion is balanced, and presents both sides of the ongoing debate surrounding the utility of the attack as well as the effectiveness of the Command staff with a historian's critical eye. The production value of the book itself is outstanding. The 1st July, 2016 is the 100th Anniversary of the first day of the battle of the Somme. Whilst this battle has become a metaphor for the terrible carnage of the First Wold War, its real story is not well known. Much controversy has surrounded the Somme offensive relating to its justification and its impact upon the course of the war. General Sir Douglas Haig's policies have been the subject of considerable debate about whether the heavy losses sustained were worth the small gains that were achieved which appeared to have little strategic value. That was certainly the case on many sectors on 1 July 1916, where British soldiers were unable to cross No Man's Land and failed to reach, or penetrate into, the German trenches. This book aims to highlight the failures and successes on that day and for the first time evaluate those factors that caused some divisions to succeed in capturing their objectives whilst others failed. An important new study, this book endeavours to answer these questions as well as challenging myths and misconceptions surrounding the battle that have been propagated for the last 100 years. The book looks at the entire Somme front on 1st July 1916, the day the battle begun, and what became the Blackest Day in British Military History with more than 57,000 casualties. It begins with the background to the Somme offensive and then at the different sectors from North to South, starting at Gommecourt and ending with Montauban. Each chapter describes the fighting in that area in detail, and it is clear the author's research (as with his previous books) is really first rate as he has used a wide range of sources from 'War Diaries' to German accounts. The area I know particularly well is Beaumont-Hammel; the chapter on that sector is one of the best I have read in a very long time. With good maps and some supporting images this is a superb book and essential for anyone studying the First Day of the Somme in this centenary year. My paternal grandfather joined the Middlesex Regiment at age 34, in the summer of 1916, and was killed during the battle of the Somme. He was a bricklayer. There are conflicting emotions associated with his pointless death - the first is to find out all I can about him, and we already know that he was listed as "other casualties" in a skirmish that saw something like 350 men and officers killed that day; the second is to read all of the available literature to get some idea why decisions were taken at the highest level to throw men at this conflict as though they were pawns in a human chess game. Paul Kendall's monumental work on the Somme answers many of my questions - I would have liked more illustrations, but other books published by Pen and Sword provide more photographic illustrations of the men who served and died, so I can't really complain. A magnificent book. The day of the Somme will always be the subject of controversy but it is certain that no serious discussion can be held without consulting this important study.